The UK’s WorldSkills competitors are set to head off for Brazil tonight — and a number of them will be boarding the BA flight from Heathrow with the encouragement of their local MPs still ringing in their ears. With the much-anticipated start on Tuesday (August 11) growing ever nearer, seven of the UK competitors were given the House of Commons boost. 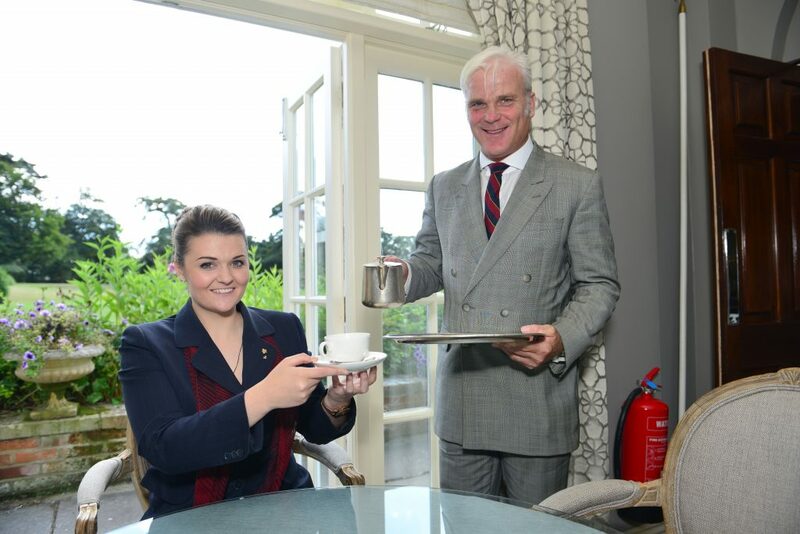 Lucy Jones, the 21-year-old restaurant services competitor for Team UK who goes to Hampshire’s Brockenhurst College and works at Chewton Glen Hotel and Spa, was treated to tea with New Forest West MP Desmond Swayne (both pictured above). He said: “Lucy has done incredibly well to make it into Team UK. It’s a great achievement and I’m looking forward to seeing how well she can do in Brazil. Chichester College’s cabinet-making competitor Edward Harringman, aged 22, and employed by Harringman Cabinet Making, met up with Hastings and Rye MP Amber Rudd, who said she was keeping her “fingers crossed” that returns with a medal. “I wish Edward all the very best for WorldSkills Sao Paulo 2015,” she said. “Edward’s success demonstrates the value of vocational education as a viable first choice for school leavers. Not only has he learned and developed a skill to a high standard thanks to excellent teaching at college, he is now the owner of a successful local business. Redcar MP Anna Turley tried her hand at plastering when she met 22-year-old Robert Johnson, Team UK’s plastering and dry wall systems competitor, who works at Classic Plaster Moulds. “I was delighted to meet Rob recently and to hear about his achievements,” she said. Joinery competitor Dale Hodgins got the chance to meet Gloucester MP Richard Graham, who was “delighted” to see the 22-year-old represent the constituency and Team UK. “Let’s all get behind Dale and show the world what Gloucester can make,” said Mr Graham. Dale is an Oxford & Cherwell Valley College learner and is employed by Oakleigh Joinery. Mike Watson, representing the UK in CNC Milling, met up with Thornbury and Yate MP Luke Hall. Mr Hall said: “Mike is an inspiration to future generations of the UK’s workforce. Eddisbury MP Antoinette Sandbach met Matt Beesley, a 21-year-old former Reaseheath College who is competing in landscape gardening. And Henley MP John Howell visited RAF Benson to meet Royal Air Force technician Senior Aircraftman (Technician) Shayne Hadland, 24. Shayne showed Mr Howell how to repair rotor blades and wiring looms as part of what is needed to keep front-line helicopters in the air. “These skills are vitally important to the safety of aircraft and it is very good that the Royal Air Force is supporting them,” said Mr Howell.